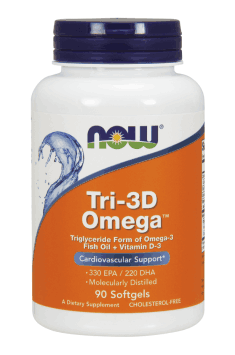 Now Foods Tri-3D Omega is a product containing a natural fish oil concentrate containing the polyunsaturated omega-3 fatty acids: eicosapentaenoic (EPA) and docosahexaenoic (DHA) acids, as well as vitamin D in the form of cholecalciferol in the amount of 1000 IU (international units). Cholecalciferol has a beneficial effect on regulating the management of calcium and phosphorus, and the functioning of the nervous system. It also reduces the incidence of autoimmune diseases and is applicable in the prevention and treatment of cancer, circulatory system diseases, and depression. Many scientific studies have proven that omega-3 fatty acids exhibit anti-inflammatory and cardioprotective properties, reduce the risk of diseases of affluence, and support the functioning of the nervous and immune systems. Modern lifestyle and the admiration of behaviours harmful for health lead to the ever increasing risk of developing mental and circulatory system diseases, obesity, diabetes, cancer, and osteoporosis. For that reason, attempts are constantly made at finding efficient treatment and prevention methods for those ailments, both with the help of drugs and dietary supplements. Supplementing the deficiencies of the polyunsaturated omega-3 fatty acids and vitamin D seems to be a promising aid in treating the above-listed conditions. Both substances are thought to be applicable in the treatment of many diseases. High-quality dietary supplements from the best manufacturers aid standard therapies by affecting metabolism, especially the regulation of biochemical transformations in the organism. The polyunsaturated omega-3 acids help to regulate the concentration of cytokines, whose elevated levels in the organism lead to the occurrence of chronic inflammations, autoimmune diseases, atherosclerosis, and cancer. Moreover, they have a beneficial effect on the circulatory system, improve the cerebral circulation and the transmission of nerve signals. They eliminate the risk of heart arrhythmia, participate in the regulation of arterial blood pressure, and restore the balance in cholesterol metabolism disorders. They also play an important role in maintaining full mental and physical capacity. Vitamin D is currently one of the most scientifically studied substances. Scientists are trying to find a link between its deficiency and the occurrence of many diseases and decreased lifespan. Research shows that people with vitamin D deficiency are much more vulnerable to developing diseases of affluence, as well as autoimmune, and neurodegenerative diseases. Because of the geographical disadvantages, the lack of sunlight, and the fact that few food products contain sufficient amounts of vitamin D, it constitutes one of the most deficient nutrients in our geographical area. The most important effect of vitamin D is its participation in regulating the management of calcium and phosphates. Insufficient vitamin D levels in the diet of children lead to bone mineralisation disorders, the reduction of bone mass, and rickets; in adults, on the other hand, they can cause bone pain, osteomalacia, and osteoporosis. There are also reasons to think that vitamin D exhibits anti-inflammatory, antimicrobial, and immunomodulatory properties. Its anti-inflammatory effect stems from the ability to reduce cytokine production. Vitamin D is capable of activating the genes that code proteins with antimicrobial properties. It helps the cells in the bone marrow to fight autoimmune diseases. A connection has also been observed between the level of exposition to sunlight and the incidence of some types of cancer. Vitamin D is thought to have an anticancer effect. Vitamin D has been observed to affect (directly and indirectly) the cardiovascular system. It has been proven that vitamin D receptors are found, among other places, in vascular smooth muscles and in cardiac muscle cells. The active metabolite of vitamin D has a direct influence on the activity of platelets, the sympathetic system, inflammatory processes, and the mechanism of blood coagulation. Affecting glucose metabolism and lipid control is the indirect influence of vitamin D on the circulatory system. Insufficient vitamin D levels in the organism can also indirectly affect the risk of developing hypertension and, as a result, heart failure. Test results suggest that vitamin D has a beneficial effect on the cardiovascular system. To sum up, Now Foods Tri-3D Omega is a dietary supplement recommended for every person vulnerable to vitamin D and omega-3 fatty acid deficiency. The supply of both components in the standard diet is very low, which is caused by the rather infrequent consumption of fat marine fish. Vitamin D deficiency can also be caused by insufficient exposure to sunlight or absorption disorders. All in all, a multitude of correlations has been observed between vitamin D and omega-3 acid deficiencies and an increased risk of developing many diseases. Complementing slight deficiencies of omega-3 fatty acids in healthy people, using a diet consisting of fishes and seafood, can be fully effective already by a dose of 2 capsules a day. However, in case of greater deficiencies or a diet poor in these products, the dose can be too small. According to the research, you should take at least 2 g of EPA + DHA to achieve significant benefits, and in case of people with coronary heart disease or atherosclerosis the dose should be higher, 3–6 g. The experts demonstrate that using higher doses of EPA + DHA, amounting for 5 g a day, is safe and does not cause any negative effects. Special attention should be drawn to the fact that the best EPA/DHA relationship showing optimal effects is 3: 2 and such a relationship has been used in the supplement.